Pestrol Orange Guard is the must-have new product for every Australian home ORANGE GUARD NATURAL CRAWLING INSECTICIDE that is RTU (Ready to use). Kills and repels bugs using the power of edible plant extracts. For use in kitchens, gardens, organic production and in healthy homes. Announcing an Australian-first in natural pest control. Pestrol is excited to introduce a unique new product to the Australian market. Unlike anything else you’ve seen, this is a broad range insecticide for indoor and outdoor use. d-Limone (Orange Guard’s active ingredient) is the major terpene made by plants to not only repel ants and all the farm but also (key) to attract pollinators. Terpenes are like the plants’ immune system, more d-Limonene fewer parasites and happier plants with more flowers. And most importantly happy pollinators. Orange guard is a perfect natural surface spray to get rid of cockroaches, ants, fleas, silverfish, moth and any other crawling insects. 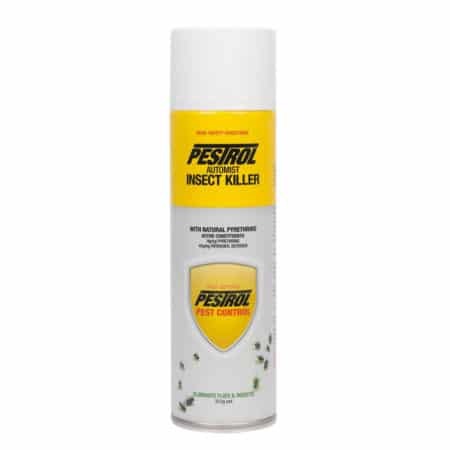 If you need an automatic insect control solutions that contain natural pyrethrins, then consider the Pestrol Ultra. It’s active ingredient (d-limonene) is steam-distilled orange peel. It breaks down the waxy coating of insects, effectively suffocating them. Orange Guard does not contain petroleum-derived chemicals and can be safely used around family and pets. It is compatible with many types of metal surfaces and composites. All ingredients in this natural surface spray meet the Food and Drug Administration GRAS(Generally Recognised as Safe) food grade standard. D-Limonene – the active ingredient in Orange Guard – is an approved food additive and is often found in food products, air fresheners, pet shampoos and the like. Our insect spray is water-based with a natural emulsifier and is 100% biodegradable. The EPA (United States of America) has certified our natural surface spray as safe for use near food, humans, or pets. It contains environmentally friendly botanical plant ingredients – Oranges. Using our Natural Surface Spray, saturate visible ants and spray the internals of your waste bin. Ants will not return. Yes. Controlling Fleas is one of the biggest requests we get with our surface spray. Orange Guard is an excellent pre-wash spray for fleas and carpet beetles. Re-apply Orange Guard, also look for the area of entry for your infestation. Insects are smart and will avoid treated areas and find new alternative routes. Orange Guard is entirely water-soluble. Any marks should rinse clean with water. For any stubborn stains use bicarbonate soda mixed with warm water. Weight: 976g Its a big bottle! The power of oranges to control crawling insects! Orange Guard is Non-Toxic Pest Control at its very best. Product worked well BUT you must review your recommended interstate (Vic) delivery company who took seven days (priority?) to deliver the product. Not good enough! !